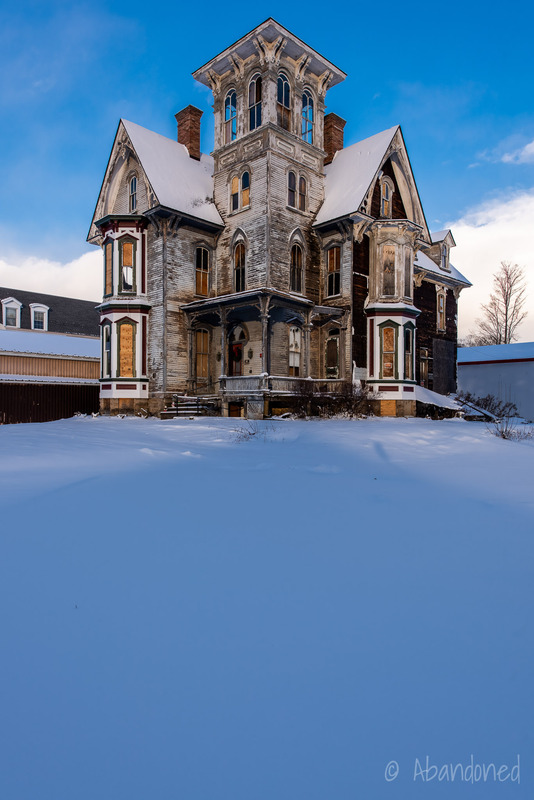 Old Hickory is circa 1880 Italianate residence in Coudersport, Pennsylvania. The house, once lavishly outfitted inside and outside, was later used as The Old Hickory, an inn and tavern. After years of abandonment, it is being lovingly restored. The three-story residence, constructed between 1875 and 1880 for Frank Knox, was lavish inside and outside. 1 2 Knox, an attorney and co-owner of the Potter Enterprise, spared no expense in the house, which featured maple, cherry, black birch, pine, hemlock, oak, chestnut and butternut woods. 3 A Tioga County native, Knox was instrumental in bringing the railroad and public water system to Coudersport. In 1903, the family sold the house to Thomas J. Lawler. 3 Lawler sold the home in January 1928 to the partnership of H.H. Pett, Willard E. Schutt, and Howard N. Schutt who turned the house into The Old Hickory, naming it in honour of Andrew Jackson. The inn and parlour were lavished with unique signs and stationery, some of which depicted Jackson riding a donkey. The caricature, drawn by a guest who had become delinquent on a bill, designed the logo instead of submitting a cash payment. H. Hollingsworth and Key Pett, of New York City, joined The Old Hickory, and decorated the building with fine furnishings and wallpaper. 3 After The Great Depression, the owners split. Willard Schutt and his wife, Agnes, stayed in town and opened a tavern in the basement of The Old Hickory. John Rigas, the founder of Adelphia Communications, purchased Old Hickory Tavern in 1987. 1 Adelphia later became the fifth-largest cable corporation in the United States. Rigas transferred ownership of the building to the Dorellenic Corporation in December 1987 and to Adelphia in 1995, 3 intending to renovate it so that it could serve as a bed and breakfast for use by employees visiting the corporate headquarters. “Old Hickory In Coudersport Tops List Of Most Endangered Properties In PA.”Solomon’s Words for the Wise. N.p., 1 Feb. 2014. Web. 14 June 2016. Gilliland, Donald. “The Picture Nobody Has Seen – Local Landmark Figures In Rigas Trial.” Potter Leader Enterprise [Coudersport] 10 Apr. 2004: n. pag. Print. “Old Hickory started as dream house.” Endeavor News 21 Dec. 2013: n. pag. Web. 14 June 2016. “Working on the Old Hickory.” Potter Leader Enterprise [Coudersport] 24 Nov. 2016: n. pag. Print. Stemcosky, Kelly. “A new plan for the Old Hickory.” Potter Leader Enterprise [Coudersport] 7 Sept. 2016: n. pag. Print. Please keep sharing updates and picture of the Old Hickory! It is fabulous! I believe Old Hicory Sold today! The Panhandle tunnel pictures–there is no caption so I’m not so sure which tunnel(s) is/are pictured. Captions would be useful. My Dad is from Weirton and I’m a railfan so I’ve been trying to track down Dinsmore Tunnel on the Panhandle east of Weirton. After much internet search it was known as Tunnel #4/Bertha/Dinsmore. No photos found; when I checked out its location in 1998 found no portal. So question is is Tunnel #4 Reed’s Mill the same on as Dinsmore/Bertha west of Burgettstown PA? Got here while looking up the PCC&StL’s bridge over the Ohio River; my Dad (born 1917!) remembers its completion celebrations. I’ve never gotten to ride over it. Hello, I am on your mailing list and truly love the pics. I am torn about asking this, and I do so with great humility. I know to ask other UrBex Photographers about locations and teaming up are both rather taboo! However, if at all possible I will be filling in my info below and would greatly welcome any offers to run with someone in my area. I am currently in the Little Rock area of Arkansas, and working on relocating back to North East Ohio. I have never once been disrespectful to a site, never have I tagged or taken anything other than pictures! I would never do anything to harm a site that I visit. I doubt I will, but would love to hear from you!